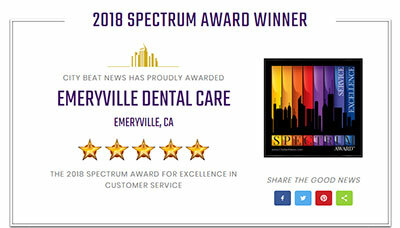 We are Emeryville Dental Care, located in the Emeryville. 6001 Shellmound St. Suite 125 Emeryville, CA 94608. We specialize in taking care of the fearful patients, aesthetically conscious patients, and the quality oriented patients. We welcome new patients! In addition, We can also take care of young children to elderly patients. Our dental services are a full range. From professional cleanings, cosmetic dentistry services, white fillings, natural looking dentures, crowns & veneers, implants, extractions, root canals, and full mouth reconstructions. We fix lisps (frenectomy), perform laser surgeries, gum surgeries, wisdom teeth extractions, sinus lifts, split ridge, & laser exams. Our doctor, Dr. Rose Magno, DDS, FAACD specializes in neuromuscular dentistry, which means we help reduce or get rid of your migraine headaches, neck aches, and pains, shoulder aches, & muscular pains associated with malalignment of your teeth & jaws/ TMJ. We provide same day implant and crown placement on missing teeth. We provide same day extraction, implant and dentures or partials over the implant. We provide conscious sedation for those who want to have a more relaxed dental experience. We are & have a more personalized dental experience setting. We are accepting new patients schedule an appointment through the website or call 510-595-1900 to schedule an appointment today. Looking forward to serving your dental needs. Check out our 2018 Spectrum Award! Dr. Magno is a graduate of the University of California at Berkeley (UCB),University of the Pacific (UOP) Dental School in San Francisco, and a graduate of the prestigious Pacific Aesthetic Continuum (PAC-LIVE now known as Hornbrook Group) & Las Vegas Institute (LVI). She is continuously educating herself and her team on the newest techniques and advances in order to provide YOU with the state-of-the-art, comfortable, personalized, and antiseptically superior dental care. Your Smile Makeover Dentist. "Visiting Emeryville Dental Care gives my family and me more reasons to smile."